Magnificent, beachfront home designed by award winning architect, located on exclusive, secluded, tropical island called Casey Key in Sarasota, Florida. This Non-Smoking, multi-level home is nestled in a jungle of lush tropical greenery with bubbling fountain and goldfish pond shaded by giant gnarled oaks. The back yard is the sugar white sand of the Gulf of Mexico with a panorama of breathtaking ocean views and spectacular sunsets. Just 200 yards away stands the historic Casey Key swing bridge, a relic of an older and simpler time that enshrouds the entire private island. Walk across the bridge to the Mainland and find jet-ski, kayak, and other boat rental facilities, surfside restaurants, and a charming waterside tropical tiki bar. Sarasota is synonymous with cultural sophistication and is home to the world-renowned Ringling Museum, Selby Botanical Gardens,and Mote Marine. Multiple other cultural attractions include The Van Wezel Performing Arts Center, West Coast Symphony, Sarasota Ballet, Sarasota Opera, numerous theaters, galleries, concerts, museums, etc. Sarasota's famous St. Armand's Circle boasts a superb array of elegant designer shops and wonderful cuisine. For the sports enthusiast, tennis, golf, horseback riding, polo, and even cricket are available nearby. Right in the backyard, of course, is swimming, boating, shelling, snorkeling, skimboarding, boogie boarding, fishing, or just wandering along the beach enjoying the frolicking dolphins, nesting sea turtles, meandering manatees, ibis, herons, and other wildlife. Disney and all the Orlando attractions are a two hour drive. Tampa one hour away. Sarasota Airport is only 30 minute drive. This stunning home was designed by an award winning architect in the style of the Sarasota School of Architecture & in the Frank LLoyd Wright tradition. It is 4 bedrooms, 3 1/2 baths including 2 complete master suites on separate levels for ultimate privacy. The home is furnished with antiques, including period appropriate midcentury icons of Noguchi, Saarinen, Bertoia, etc and luxuriously appointed with all amenities to provide a perfect home away from home. Spectacular views are throughout the house. The kitchen, all baths & 2nd master suite were just remodeled. This is the perfect setting for an active fun-filled entertaining day. And then when evening comes, the spell of the fading sunset and the soft spill of the waves is irresistible. My mom bought this house twenty years ago and over the years, lovingly renovated with the help of the original architect, Carl Abbott, filled it with period-appropriate designer furniture, and opened it to her extended family every summer for three generations of toes in the sand. It's my honor as her daughter to continue her tradition of concierge rentals and family togetherness. The location is without comparison. We love owning an architecturally significant home directly on the beach, yet close to all the downtown Sarasota cultural attractions & recreational activities. 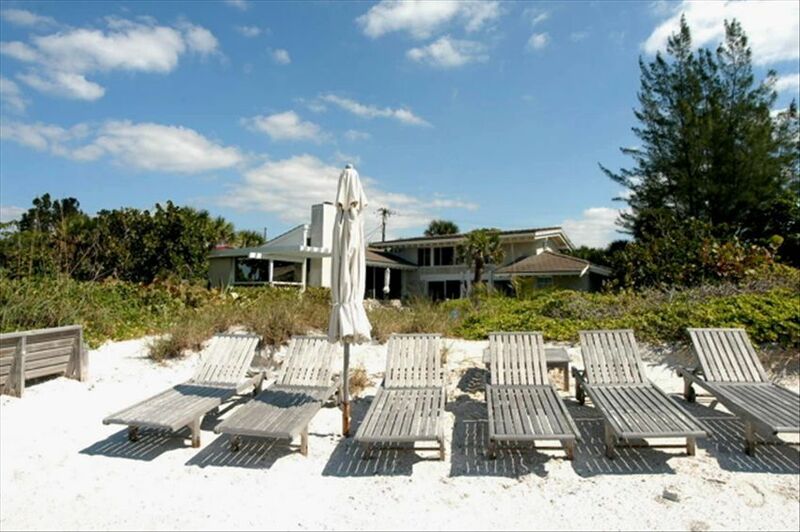 Casey Key is quieter and more private than nearby Siesta, Lido or Longboat, with many of the original structures from the 1920's through the 1960s still standing and lovingly maintained. Rates vary. please inquire . In season rate $600./day Out of season rate $500./day Monthly rate varies $15,000-$18,000. 12% Florida tax & maid's final cleaning fee (variable) will be added minimum rental stay varies seasonally. please inquire.